Ready for week 15 of the 52 Photos challenge? I want to get started on this challenge. I just submitted my first one. I submitted my photo a couple hours ago. Do they not immediately post to this thread or do y’all have to approve first? Just wondering if I should worry that I didn’t do it right again. HA! Karen, posting your photo to the Space page and posting to this thread are two seperate actions - both of which you have to do - although you are not required to post to this thread,. There is NOTHING automatic about the process. All the photos on this thread have been posted by the writers, just as they have been uploaded to the space page by the writers. The Space page is the more important place to upload the photo because that is where it counts for the challenge and the badges. Hi Robynne, yes, it makes sense. I thought, as you said, I just had to post on the space page. Let me search the help pages today to figure out how to post a photo in a comment or answer. Thank you! This is such a wonderful photo. 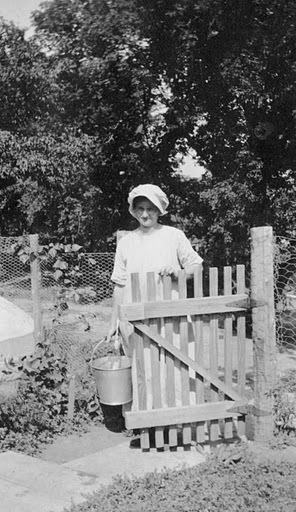 I love the gate and her with the bucket in hand. Susan, I love this photo -- so idyllic. Reminds me of a kinder, gentler time. Very spring-y! 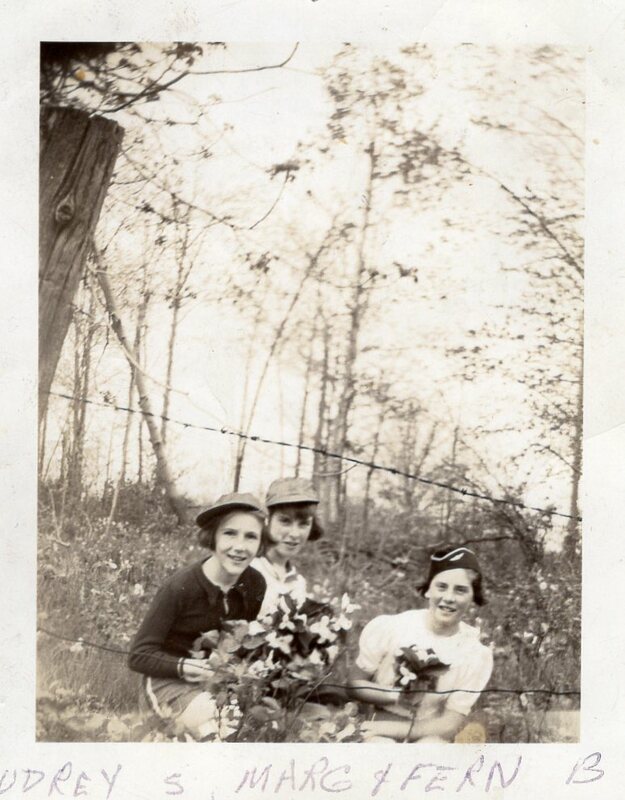 Kinda makes me wish I could see all the colors of the flowers, but the B&W makes the girls more the focal point. What a beautiful photo and two beautiful girls. 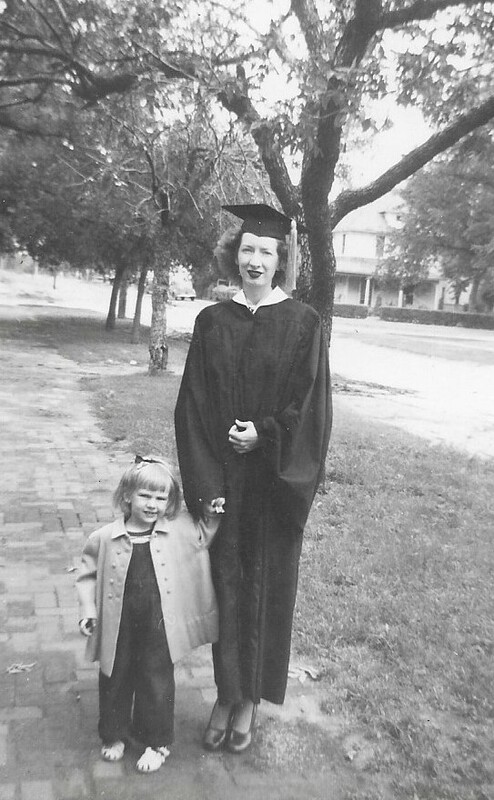 This is a Spring photo taken 24 May 1948 of my mother, Clarice Marvin Lovelace, and me. 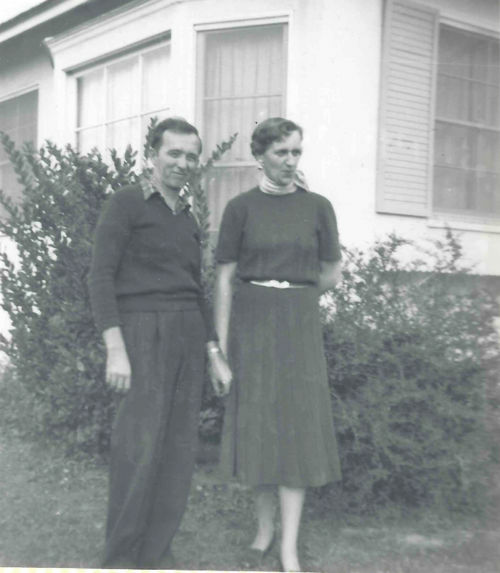 She had started college before WWII, but quit to help with the war effort by helping build B-29s in Wichita, Kansas, Being a young widow, as my father was killed in WWII, she felt she needed to finish her education to support the two of us. She was the first member of her family to go to college, so this was a very special Spring day. Look at you... such a cutie!!! I think it's so cool that she helped build BOMBERS, and I know she was proud on this day!! Great pix!! Thank you Lynn. Yes, she and her best friend left Oklahoma and worked in the Boeing Plant during the war. Thank you Susan. Yes, it must have been a hard time for her, as he was considered missing when I was born. Thank you Susan. She had firey red hair, wish the pictures of her were in color. What a wonderful story and photo. Thanks for sharing with us. 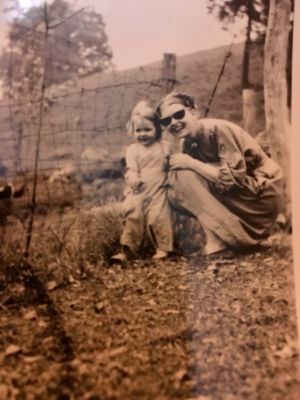 This picture is in spring of 1949 or so, must have been my first trip to my uncle's farm in West Virginia. My mother is on the right. Both you and your mother have the sweetest smiles. What a dear photo. Thanks for sharing it. 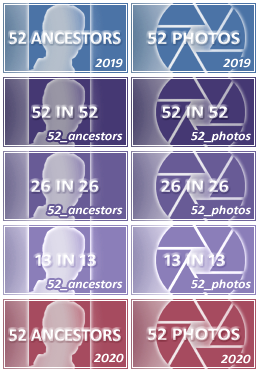 I dont have any ancestral pictures taken in the spring. But I do have some photos of my most favourite flowers that I personally took photos of, several years ago. 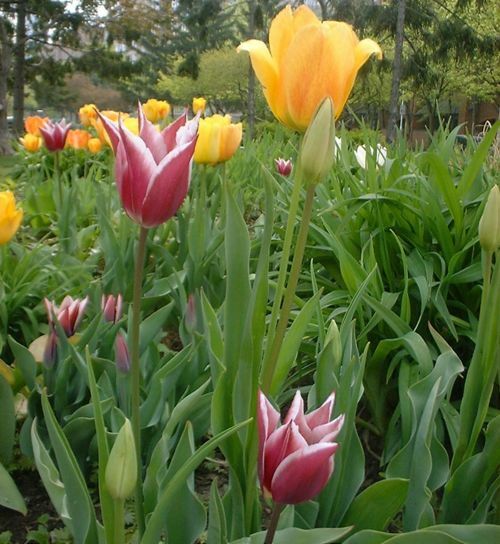 These tulips were growing around my neighbourhood in Toronto, Canada, in May 2012. Beautiful! I love tulips too -- and now I live in a place where they will grow. 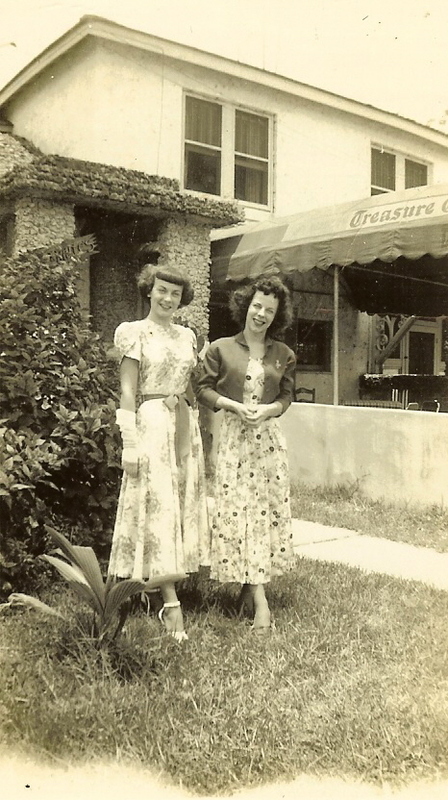 My grandma (at right) and her younger sister, Juanita, possibly taken around Easter. Looks like prom night is tonight! 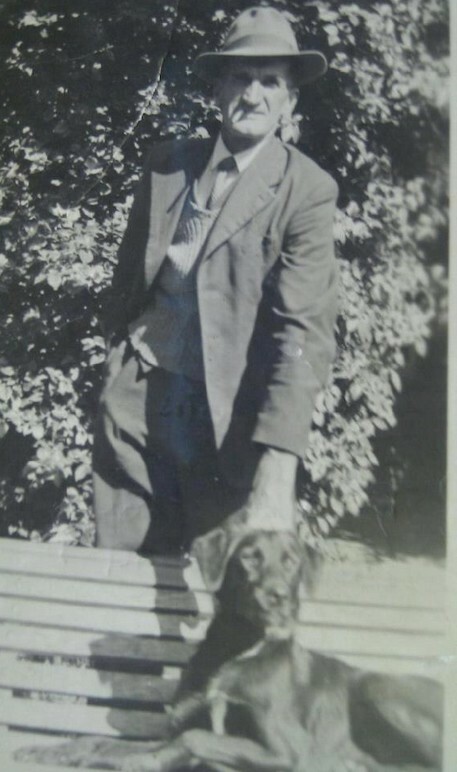 My grandfather with his dog Tiger, on a spring day in the early 1950s. 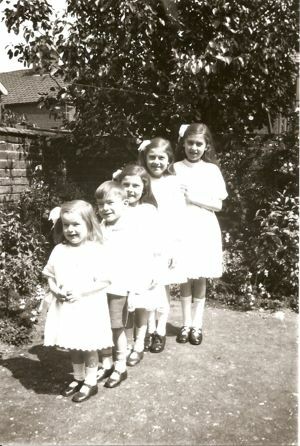 A candid photo in everyone's Sunday best, on a spring day in the late 1940s. 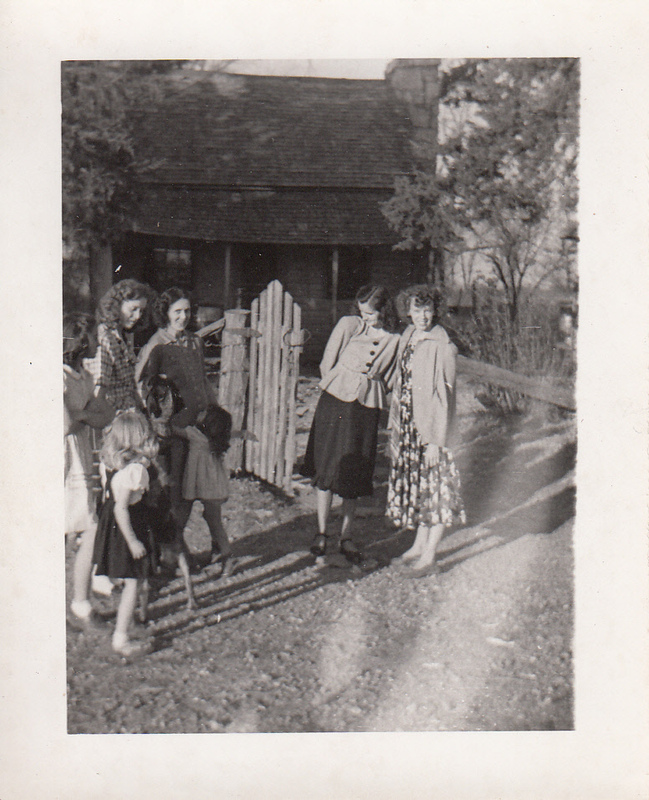 My great-grandmother, Maud, and my grandmother, Betty are standing at the right in the photo. 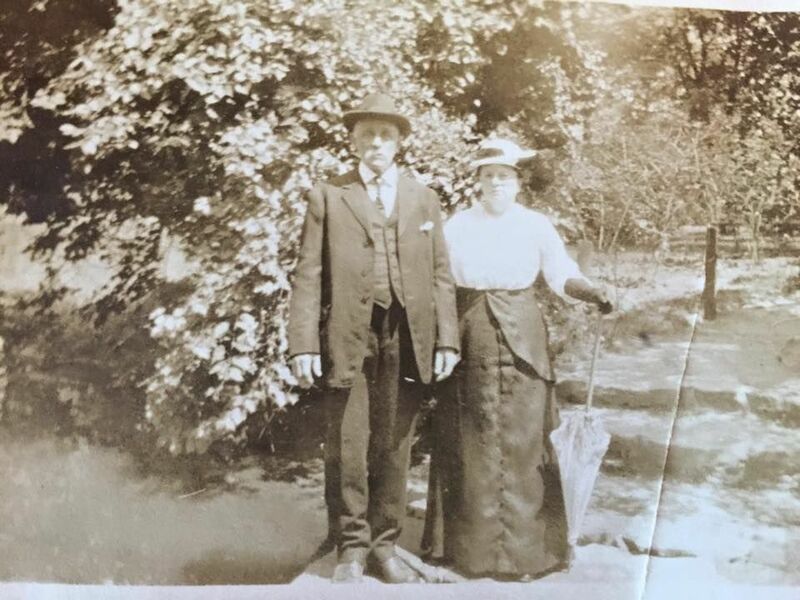 I think the people at the left are probably one of my great-grandmother's sisters and her children or grandchildren. I especially like the little girl standing on her tiptoes, trying to get the smiling woman to pick her up. Edited: I just realized this is week 13 of the photo challenge for me. Hooray! In Valencia, the city where I live and where my mother was born, the arrival of spring is celebrated with a well-known festivity called "Fallas". 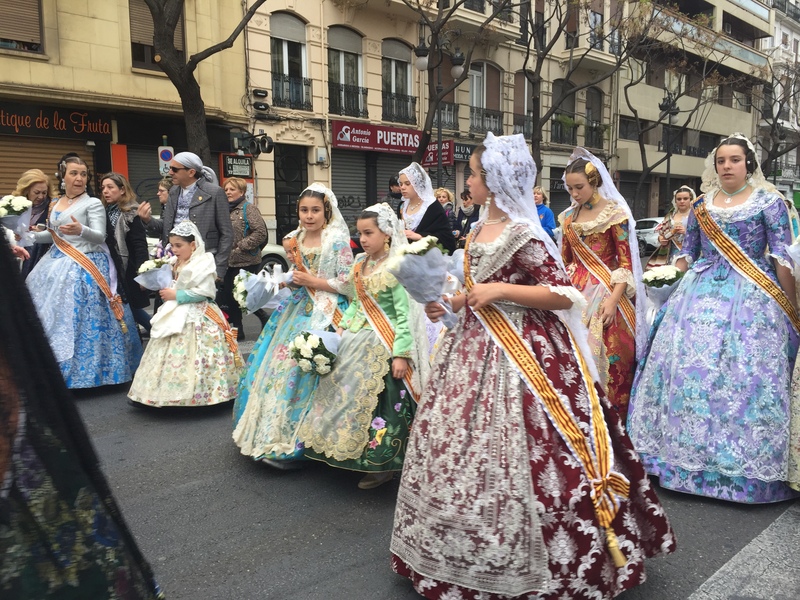 During the "Fallas", girls and women parade with traditional dress. 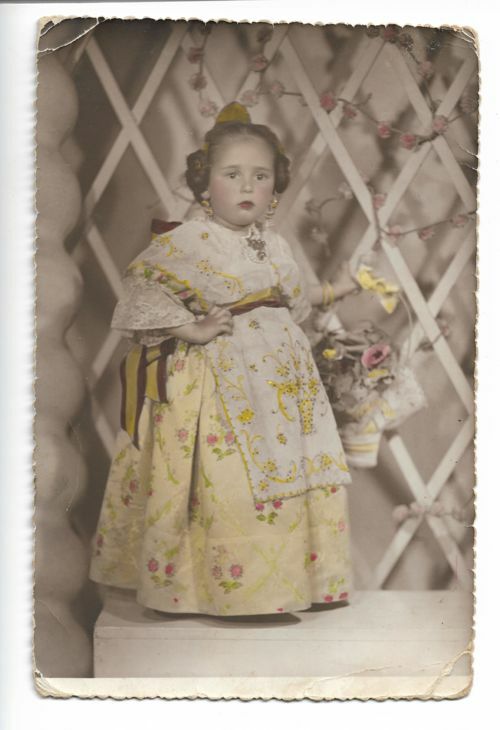 Although my grandparents were not Valencians, my grandmother wanted her daughter Milagros to follow the tradition of her new city: this is my mother, wearing her fallera costume. I love this picture. Her dress is just as adorable as can be. The backroom is very cute with the flowers going in every direction imaginable. Her spring basket is just that - so springy. You picked the right picture for spring. Oh the Fallas Festival in Valencia is something! The kids (everyone) dress up in traditional costumes, huge statues are built, food, fireworks - some years we take the bus up for the day to enjoy it. Do you still live near Valencia? If so, and next year you come to see the Fallas, let me know and we could meet if you want. 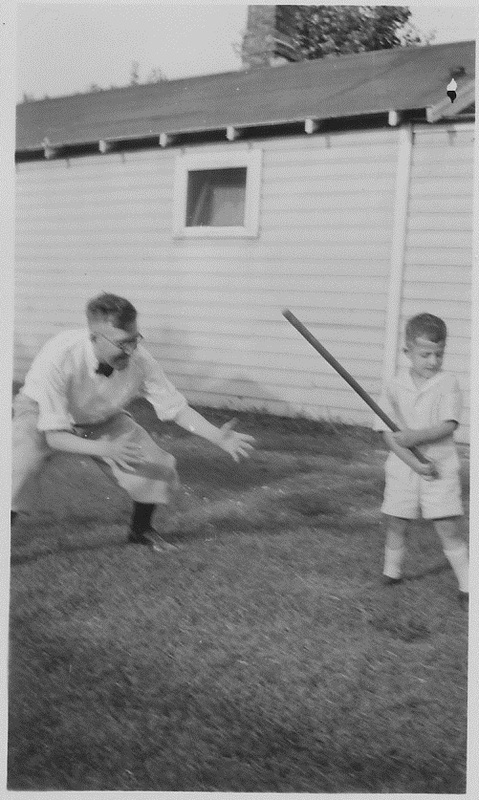 My grandfater, Harold Knott Rammel and his son, John Allison Rammel, enjoy the Spring time beining of baseball season. Baseball, a sure sign of Spring. This is a picture taken in 1915 of my Grand Aunt (far right) Gertrude Mae MacCormac, about 15 yrs old, taken with her sister-in-law, niece, and nephews in Superior, CO. Her parents, Frances John Leonard MacCormac and Ella Mae Hake started Superior, Colorado. great photo Pamela everyone look so very well dress. 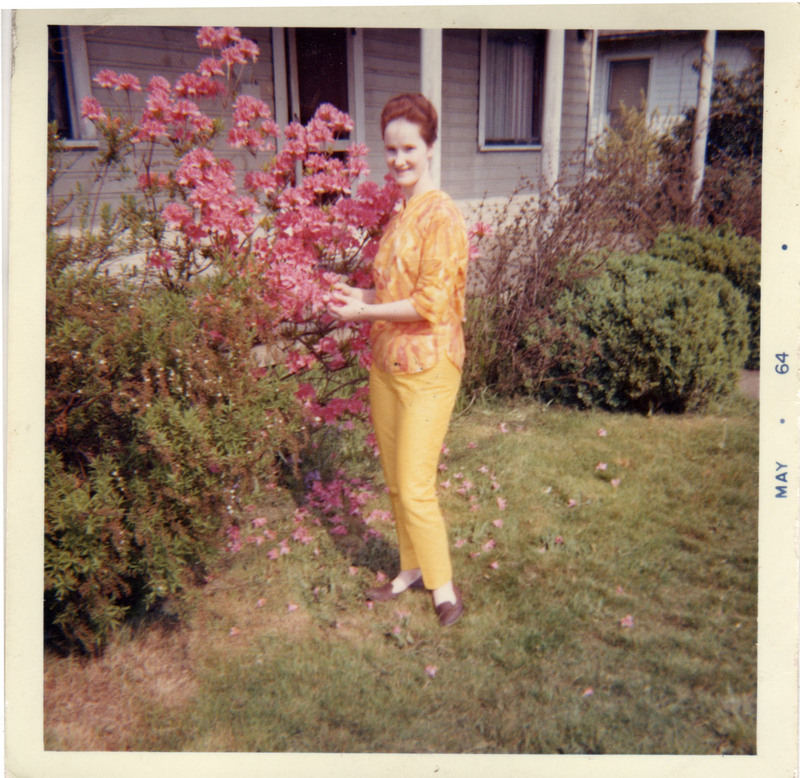 My mother Spring 1964. At this time she's a 26-year-old mother of six. She ended up having nine kids altogether. Your mother looks amazing, and this is a great spring picture. Sounds like my mother! I just posted HER picture! 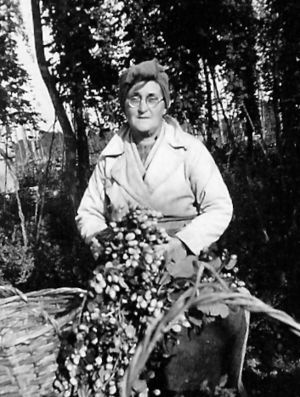 She had six children by 1964 - and nine by 1970. 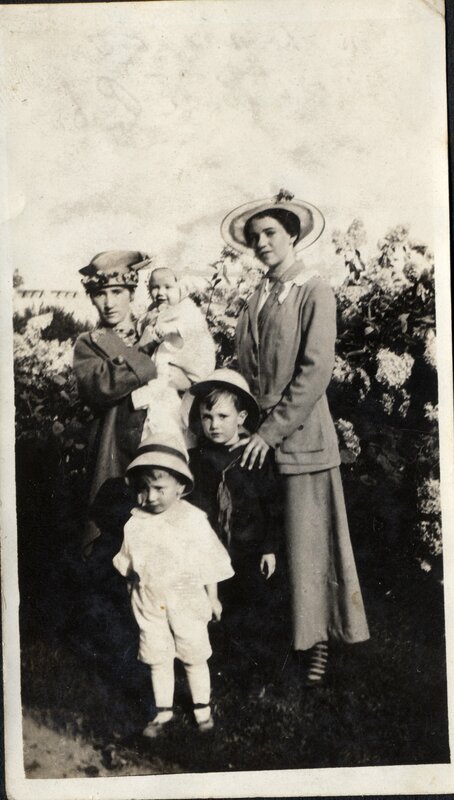 My mother (the youngest) with her brother and three sisters, taken in their garden in Norwich, England in April 1924. That little guy has a lot of sisters! Springtime in the family garden with Mrs. Brown. 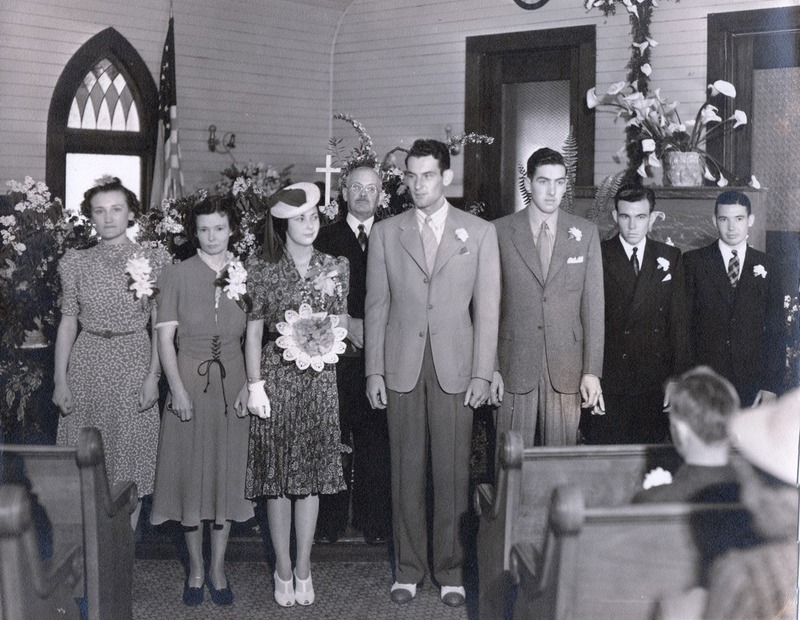 This is a photo of my Aunt Jean's Spring Wedding to Chester Slinger. They were married on Easter Sunday, 9 Apr 1939. Also in the wedding party are my Aunt Rosemary, Aunt Lois, Chester's brother, my dad James and Uncle John. Unfortunately the marriage did not last, and you might note that some of the wedding party do not look very happy. ...Just noticed that that was 80 years ago today! Robin i absolutely love this wonderful photo you are sharing with spring wedding. But how sad the wedding did not last that is sad. What a great day to get married. And they all look so happy. I love all of the flowers in the church, and your mother's bouquet. It takes my breath away. I remember shoes like your dad is wearing. Typical of the day. This photo was taken Apr. 19, of 1916. 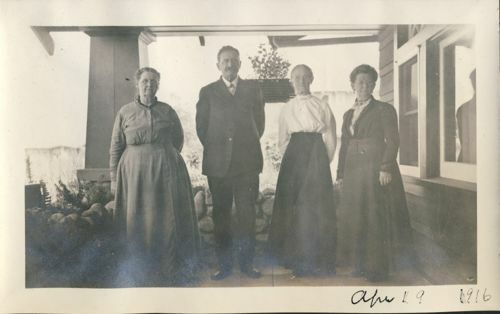 From the stone wall around the porch, I'd guess it was taken at my great-grandfather's house in Orange, California. 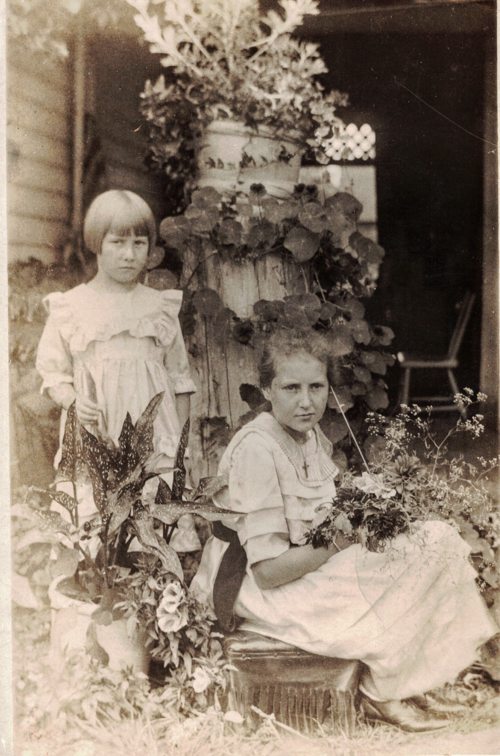 Left to right are: My great-grandmother, Rachel Stoner, daughter of Rev. Peter Winebrenner, Christian Church circuit rider in Noble and nearby counties in Indiana in the mid-to-late 1800's; my great-grandfather C.C. Stoner, who, among other things, crossed the country during his lifetime, being born in Pennsylvania in 1844, was in the civil war (Indiana), served in Kansas as a state legistator (People's Party), owned, edited and published the Lincoln Sentinel (Kansas) for a few years, and was on the city council and also served as Mayor of Orange; my other great-grandmother, Julia Forrey, whose grandfather William Read came over from Scotland in the 1750's, and served as a blacksmith in the Revolutionary war (she remembered crossing the plains (from Ohio to Iowa) in a covered wagon as a girl); and Rachel Stoner's sister, Barbara Ohlwine. I don't know much about her, and this is the only photo I have of her. This is my favorite uncle and his wife outside their home at Easter 1956 when I had a new camera. The back was just as bad. This was during one hour of rain. The water has receded. Lots of damage, mud everywhere, stream banks hit hard. If you look hard you can see water flowing across the road filing the front yard. There is mud everywhere. Lost all of our mulch, but no plants. A little water in car, but none in house (one more foot of water and we’d have been under). Part of driveway washed out. I’ve got some work ahead of me.. Sorry you are having such terrible flooding and it got in your car. Hope things get better there soon.